What is Section 38 of the New York Lien Law? 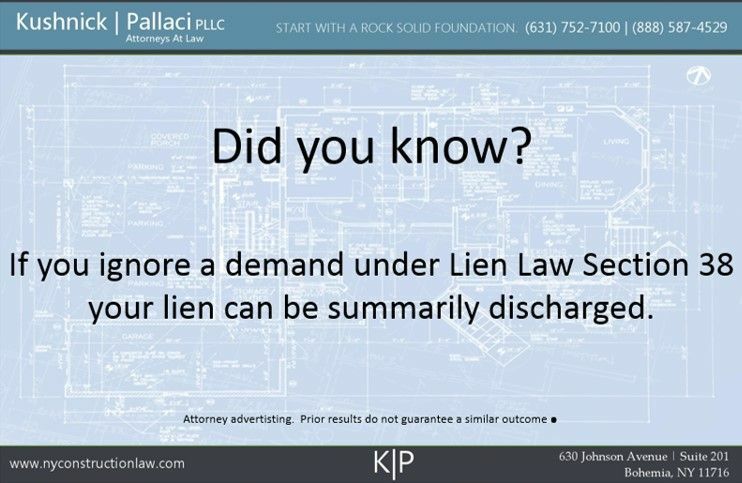 Pursuant to Section 38 of the Lien Law, an owner or general contractor can force a lienor to “itemize” a mechanic’s lien that it has filed. To demand an itemization the owner or contractor serves a written demand upon the Lienor, by certified mail return receipt requested, demanding that the lien be itemized within five (5) days. The itemization must be specific and include line item explanations of labor and materials. 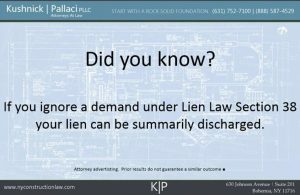 What happens if Lien Law Section 38 Demand is ignored? If you do not respond to a properly served demand for an itemization then the owner or contractor can, ultimately, have the lien discharged. But discharge under Section 38 is a two step process. First, a motion to compel a response under Lien Law Section 38 must be made. This is done through a special proceeding. Second, assuming the Judge has granted the order compelling a response, if the order is then ignored then Section 38 provides that the contractor or owner may then serve a motion seeking to discharge the lien based upon non-compliance with Section 38. Why should I serve a Section 38 Demand? Forcing a lienor to itemize its mechanic’s lien is a powerful tool. Aside from the most basic benefit of having a better understanding of the mechanic’s lien, it can also provide insight into potential avenues to challenge and defeat the lien. Perhaps the true value of demanding an itemization is that the itemization must be verified under oath. That makes it a sworn statement that could be used against the lienor in a foreclosure action and is even a potentially powerful impeachment tool during cross-examination. The construction attorneys at Kushnick Pallaci regularly prepare Section 38 Demands and responsive itemizations. We also regularly prosecute and defend Special Proceedings under Lien Law Section 38. Contact Jeffrey Lhuillier to learn more. This entry was posted in Itemization of Lien, Mechanic's Liens and tagged Lien Law Section 38, Mechanic's Lien by VTP. Bookmark the permalink.